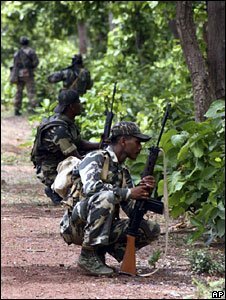 Thousands of Indian paramilitary troops and state policemen have launched a large offensive against Maoist rebels across five states this week. "The offensive has started. The federal government is trying to co-ordinate it but not take command of it," he said. 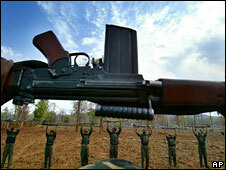 The government says the five states where the offensive is taking place are the worst affected by Maoist violence. Home Minister P Chidambaram is personally co-ordinating the operation in West Bengal, Jharkhand, Orissa, Chhattisgarh and Maharashtra. "The purpose of this operation is not to engage in gun-battles but to re-assert the authority of civil-administration in areas dominated by the Maoists," Mr Chidambaram said on Friday. He said that the progress of the offensive was "satisfactory" so far. The Maoists have a presence in more than 200 districts across 20 states, officials say. They say that they are fighting for communist rule and the rights of poor peasants and the landless. More than 6,000 people have died during their 20-year fight. "Law and order is a state subject under the Indian constitution, so we have requested the states affected by Maoist violence to do their bit," the home ministry official said. "We want to drive them into a headless condition, so we will go after the leadership," he said, "but we don't want a Sri Lanka-type operation that could cause much collateral damage to innocent civilians. "So we are specifically targeting the Maoist leadership and you will see a lot of special operations based on specific intelligence." The official said that "almost all the states are doing their bit", and that a special operation in West Bengal earlier this week - in which Maoist military wing chief Koteswara Rao narrowly escaped arrest - was a good example of that. Railway minister Mamata Banerji - who has been accused by West Bengal's government of having links with the Maoists - visited the Junglemahal region at the weekend, and asked the rebels to stop the violence and join negotiations with Delhi. However the Maoists rejected her appeal, immediately prompting Delhi to give the go-ahead for the latest offensive. Officials say that 42 battalions of the paramilitary Central Reserve Police Force (CRPF) and Indo-Tibetan Border Police (ITBP) are taking part. Mr Chidambaram has promised more forces to any state if that was required. He said that the government was left with no option but to act because the Maoists have not responded to peace overtures.